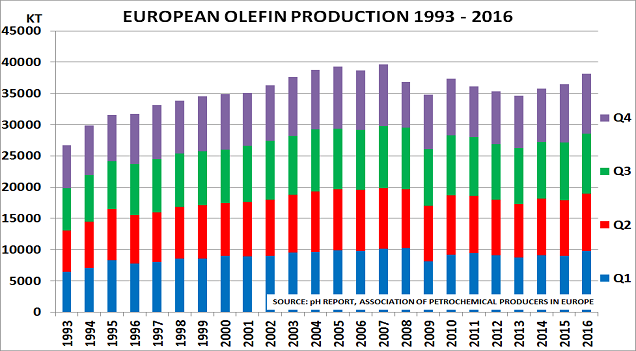 In fact, the chart gives a clear indication that European ethylene production is now in steady decline. Operating rates were just 78% in 2013, worryingly close to the 77% seen in 2009. That might have been seen as a one-off post-Crisis problem. But data since then suggests a long-term trend is now underway. Propylene data confirm the miserable picture. It was the highest since 2010 at 14.6MT, due to changes in severity to maximise output. But Q4 was weak at 3.4MT, and lower than 2012 as propylene prices came under pressure. Butadiene was the same story, with output at 1.9MT in 2013 also the lowest since 2009, and otherwise the lowest since 1996. 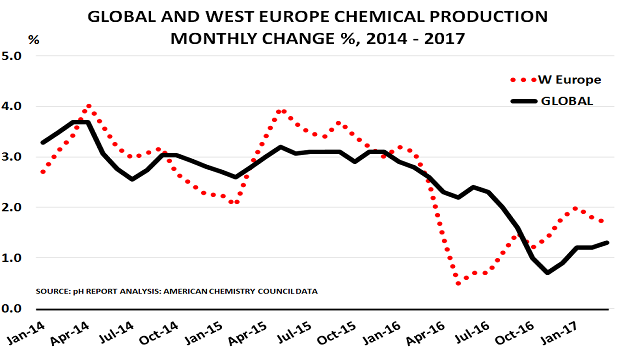 The lack of recovery in the European car market continues to take its toll, as the blog will discuss later this week in relation to the problems at Lanxess. The above chart would have seemed unbelievable at any time in the past 30 years. It shows the performance of propylene and butadiene relative to ethylene. Not because it shows butadiene prices racing ahead relative to ethylene (green line). This happens routinely during a downturn, as tyre demand is more robust than for polymers. If people are not buying new cars, they still have to buy new tyres for existing cars – for legal and safety reasons. But the record level of the butadiene premium to ethylene, an average of 170% in 2011, does give a clue to the dramatic nature of the disruption that has taken place. The real shock, however, is that propylene sold at parallel prices to ethylene through the year (blue line). Not only has this never happened before. But it is also contrary to the main rationale for propylene sales, as this developed during the 1980’s. The key is that markets have become supply-driven. Oil production and refinery output have been reduced due to lack of demand. This has reduced ethane availability in the Middle East, and naphtha availability in the West. Equally, the dramatic increase in the price of crude oil versus natural gas in the USA, due to financial speculation, has prompted a major switch from liquid to ethane feeds on the crackers. Propylene supply has therefore been reduced both by lower refinery runs, and by the switch to ethane feeds, as these produce virtually no propylene or butadiene. Lower cracker operating rates have also helped to tighten markets, particularly for butadiene. •	Will buyers still be interested in using propylene for its commodity applications such as packaging, if it is no longer price competitive? •	Can crude oil really maintain its current premium to natural gas? The answers to these questions are really a zero-sum game. Those who get them right, stand to make a lot of money. Those who get their analysis wrong, will likely lose a lot of money. The blog itself would be extremely cautious about ignoring affordability issues, and simply assuming current trends will automatically continue.